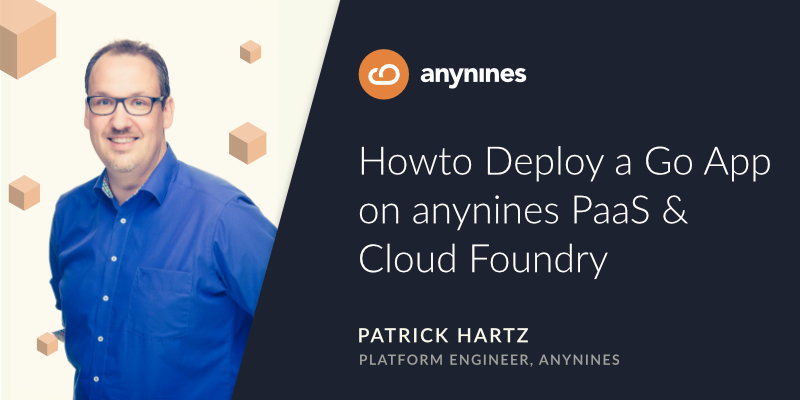 In this blog post, we will create and deploy a sample go web app to the anynines PaaS and Cloud Foundry. We assume, you’ve got Go 1.9.2 set up, an anynines user account and the anynines CLI tools. We use the standard go libraries to implement a simple ‘Hello World’ http server. The web server uses the port of the environment variable PORT provided by the application server (called Diego in Cloud Foundry Terms) when run on Cloud Foundry, otherwise it listen to port 8080. Open https://localhost:8080 in your browser. Let’s deploy your app to anynines. You will be asked for a space. You can use ‘test’ for testing purposes. Now a manifest file is needed to tell anynines what to do with the web app. The manifest may begin with three dashes. specify the number of instances and how much memory the application can consume. provides a hostname or subdomain in the form of a string. The host is needed to address your application. Ensure the name is unique, otherwise it is possible the host is already taken and you’ll get an error upon deployment. specifies the custom buildpack to deploy the application. The buildpack provides framework and runtime support for our go app. to your app’s name. The buildpack will then be able to detect and compile your go app. Additionally, you can use native go vendoring in the future. Now there must be two files in the folder. Find a working example of the anynines go example app on github & have fun.